Talking to reporters today at One Buc Palace, Bucs icon Ronde Barber made it clear that daily during the offseason he heard Greg Schiano talk to the team about the new conditioning standards that would greet them in the form of a conditioning test on the day they reported to training camp. Well, that was today, and an undisclosed number of players failed the test, Schiano said. And Barber didn’t seem to have any pity for his brethren who knew what was coming. Their punishment/limitations were not disclosed by Schiano, who made it clear that he was “disappointed” but not surprised by those that didn’t meet the “cardiovascular” demands. But Schiano’s body language at the podium was not one of concern. Schiano said this is common across the NFL but he would expect 100 percent success from the Bucs on future Day 1 testing. Now Joe’s not about to go on a rant blasting players without knowing how close they were to the standards. A trusted source told Joe that Carl Nicks was one of the guys that didn’t pass. But for all Joe knows, for example, Nicks missed the cut by 3.3 seconds on his final sprint. Schiano said there were different standards for different body types. Regardless, it’s not a great start, but hopefully a learning experience. And it’s going to be interesting to see how Schiano disciplines those that missed the mark. Joking, of course. It is not surprising to see the failures. If there weren’t failures then Schiano set the bar too low. This sounds about what I expected, and, in a sick sort of way, is good news. just saw the picture the Bucs posted of Carl Nicks reporting to training camp this morning and I could have told you he wouldn’t pass any conditioning test… dude is as wide as a house and looks like he wants to eat a couple d-linemen for breakfast. That’s what training camp is all about, getting these guys back into football shape after their lengthy vacations due to the long off season. Plenty of time ’til the first snap. Glad to see the demands of the new regime. No more optional practicing, quitting, and pisss poor effort. The big heavies always have trouble with conditioning tests. Comes with the territory. As long as they perform on game day I don’t really give a rip. they should put a bucket of church’s in front of the treadmill!!! Everyone is equal, how you arrived on the team, doesn’t matter. How big your contract is, doesn’t matter. Who you were last year…doesn’t matter. I’d say Day 1 of camp and Schiano is a success. So who failed? OL’s and DT’s? Give me a break. The easiest part of their job is staying in shape during the off season. How do you fail this test? This is what happens when you pay hundreds of thousands if not millions to lazy 20 year olds. Not sure why these guys wouldn’t be in the gym 3-5 days a week in the off season. 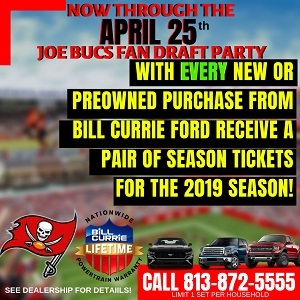 east bound and down loaded up and rushing were gonna do what they say can’t be done, we got a long way to go and a short time to get there,were superbowl bound just watch ole buccaneers run!!!! old schianos on the doorstep and he don’t like what he sees, you can’t dodge em you can’t duck em so you keep them bucs a running and give em hell. do do do east bound and down loaded up and rushing were gonna do what they say can’t be done just watch old martin run.